A helpful resource is eatthismuch.com, which will create menu plans and shopping lists for you. When you have the recipes you want to make, go the store to stock up on the ingredients, then do your batch cooking. I often choose Sunday to prep a couple of quick, easy meals that make large amounts I can portion out and pop into the freezer or refrigerator for my week. One-pan meals: Throw your protein, starch and vegetables into the oven all at once. Crockpot meals: What’s better than tossing a bunch of ingredients into a slow cooker and letting all the flavors meld together while you go to the gym, meditate, go for a walk or enjoy a hobby? One-skillet meal: Try a quick stovetop stir-fry or a recipe that allows you to finish in the oven and walk away. Purchase pre-cut produce. Use frozen produce. Throw a bag of chopped, mixed vegetables into a stir-fry, or microwave a bag of vegetable steamers as a side. Use canned beans instead of dried in a dish or to top a salad with — they’re a great source of fiber and protein. Rinse well in strainer to remove the liquid, which contains excess sodium. Use canned tuna, salmon or chicken. Put these on a salad with some tasty vinaigrette for a quick and satisfying meal. Use rotisserie chicken (pre-shredded or whole). Add it to a lettuce wrap with some cheese, healthy condiments and other vegetables for a simple lunch option. Cook a protein in a crockpot to use in different dishes throughout the week. Mix it with some low-sodium taco seasoning (or make your own), guacamole, cheese, low-fat sour cream, beans, vegetables and salsa, and wrap it all in a whole grain tortilla to make a burrito. Buy hard-boiled eggs for a quick breakfast or snack. Purchase grains already partially or fully cooked, such as Uncle Ben’s boil-in-bag brown rice or Seeds of Change from Costco. 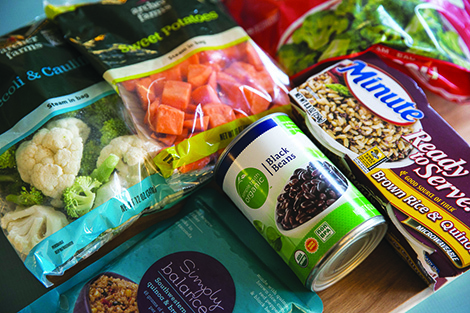 Buying grains that are already cooked or partially cooked is one of the tips from a registered dietitian for no-cook meals. is a registered dietitian for MultiCare Health System, a not-for-profit healthcare with hospitals, clinics and services in Pierce, King and Kitsap counties and Spokane. Log in | 49 queries. 1.443 seconds.